Any task I can complete while binge watching my favorite TV show is a task way less daunting. (I even made a list of 75 productive things you can do in front of the tube HERE.) 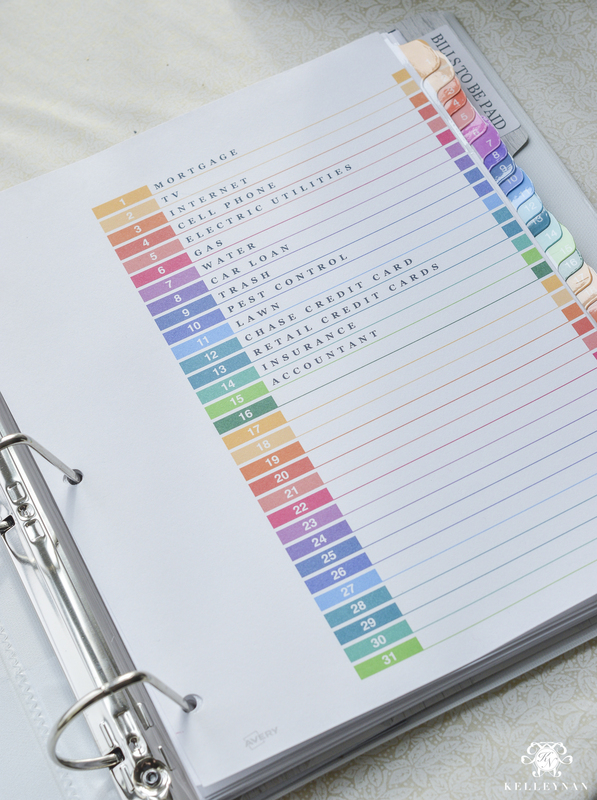 Since it is still the beginning of the year, organizing is at the top of my list. But, in addition to full room clean-outs, I’ve also been tackling a few projects that don’t sequester me in closets for full afternoons. Below, I’m talking about three things to organize while watching TV that will help set the tone for the rest of the year. One goal I have for 2017 is to be more timely. 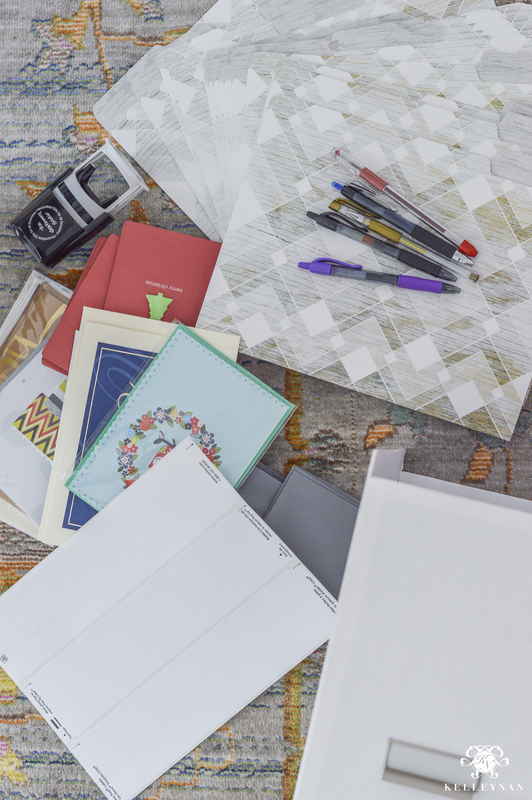 More often than not, family birthdays actually occur days before our cards arrive. I keep them written in my planner but the simple task of preparing and sending a card never seems to happen on time. 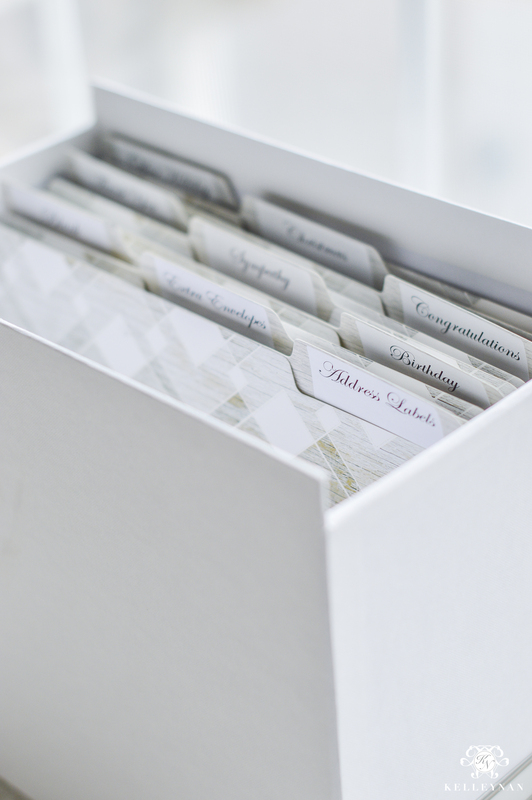 To help improve, I created a card box for all occasions – complete with all the essentials needed to quickly reference and successfully send a card for almost any event. My favorite place to purchase cards is HomeGoods. They have the most adorable, embellished pretties for $1.99 or less. I have gotten in the habit of buying several at a time to always keep them on hand. Swinging into the grocery store last minute and picking them up on an as-needed basis has gotten so expensive. 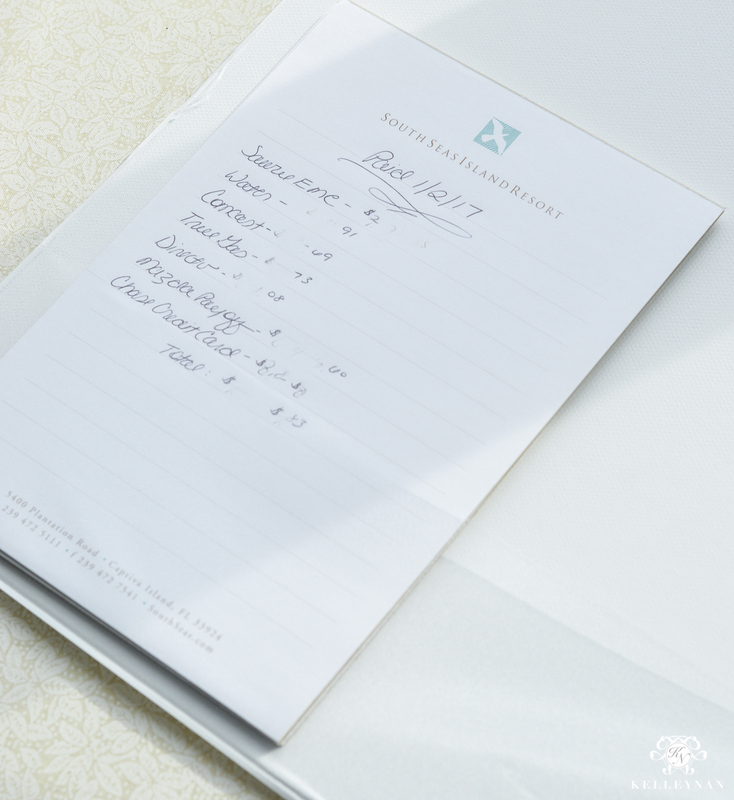 Planning ahead saves money and helps ensure you are always prepared to send a little something out quickly. 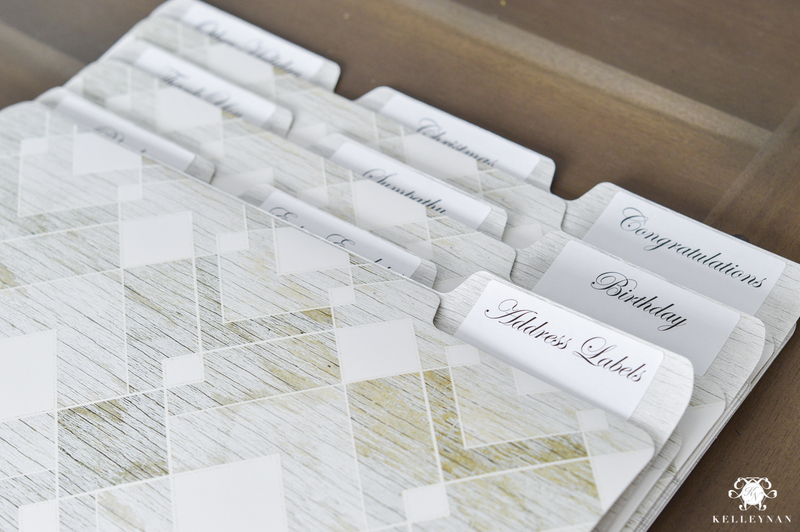 After taking inventory of my cards and thinking through occasions, I created folder labels for a variety of categories, address labels, extra envelopes, and blank cards. My mom gave me a perpetual calendar a long time ago and it was seriously the coolest, most helpful tool. But, I didn’t hang it, keep it visible, or utilize it like I should have. *Mom- skip over this paragraph 😉 To be honest, I’m sure it’s still shoved in a drawer somewhere that still needs to be organized. 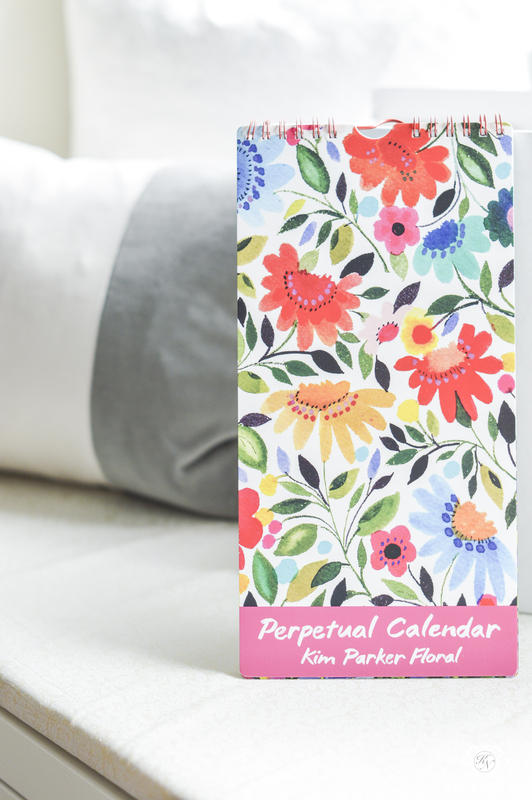 I decided to make a fresh start and ordered this handy perpetual calendar for under $7 (plus free shipping). 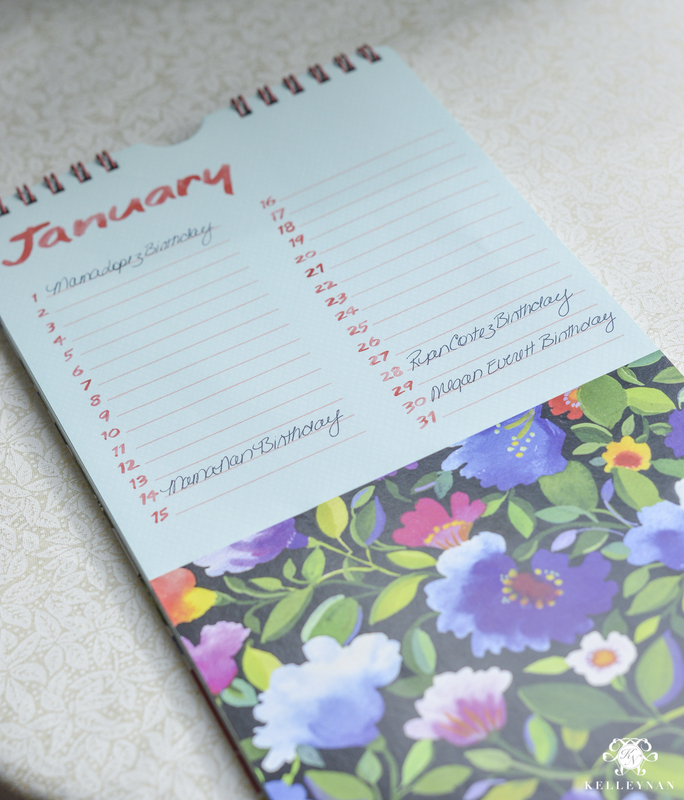 Each month, you list permanent dates, anniversaries, or any other notable days that occur each year. Having birthdays all together will help a ton in being more organized and timely with our well wishes. 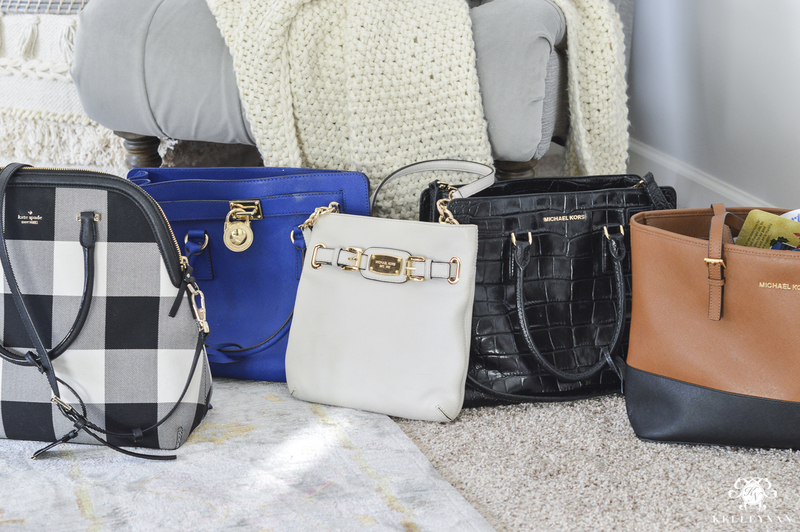 I used to be a pro at switching purses often. 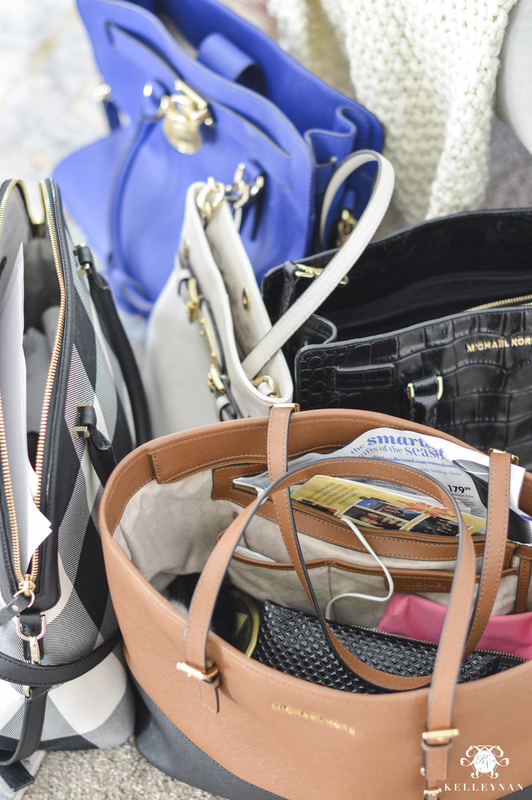 I have a pretty elaborate arsenal in my closet but am somewhat ashamed of the number of purses I had stashed all over my house and in my car, still filled with loose contents. 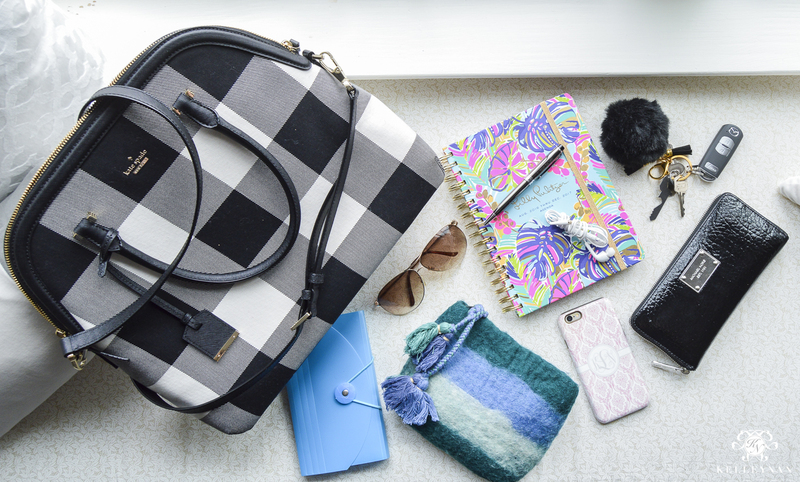 It has been a long time since I have cleaned out my purse purses and have gotten in the hurried habit of pulling essentials from one and transferring them to another, but not actually cleaning out the formerly used bags. 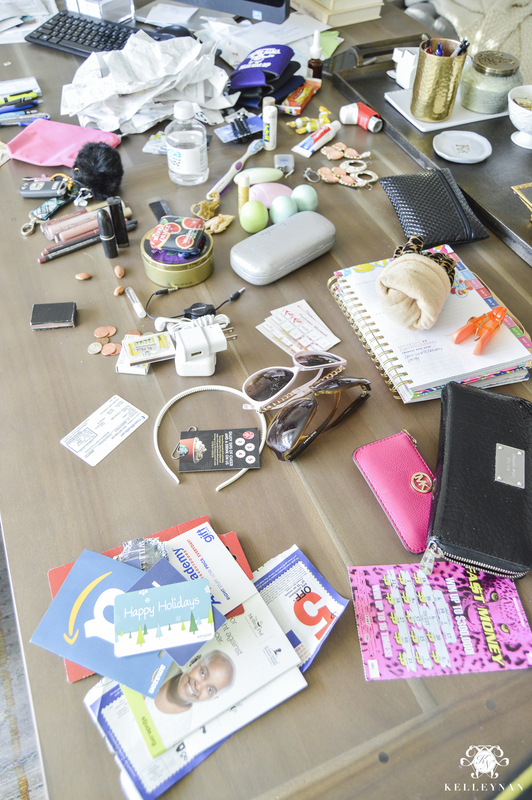 I gathered all my purses together that were still filled (think year-old hotel key cards, 2014 receipts, expired coupons, “lost” jewelry, etc. I emptied the contents from all of them. It was not pretty. I sat down with a trash can and sifted through all the piles, grouping like items together. Then, I started paring down. I gathered the necessities and essentials and returned all the other loose items to their rightful homes. 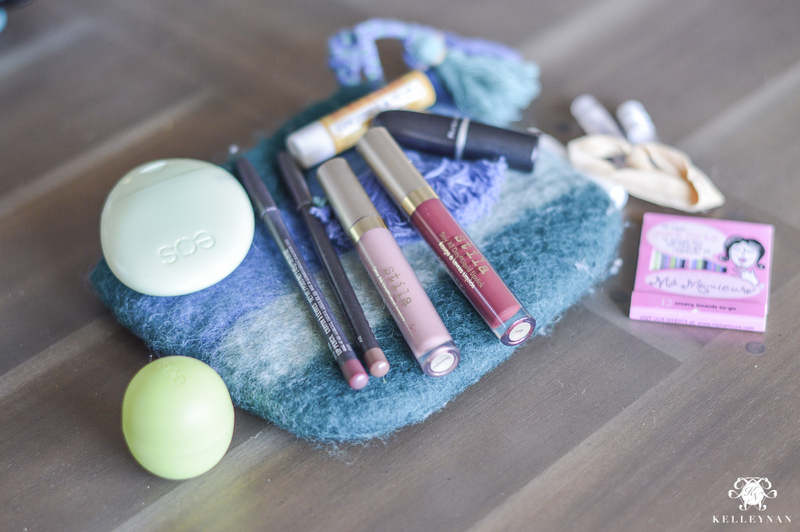 I keep my touch-up cosmetics in a pouch of their own. While they no longer carry it, I found this adorable wool pouch from Anthropologie. I went through and cleared out my wallet and coupons, too. 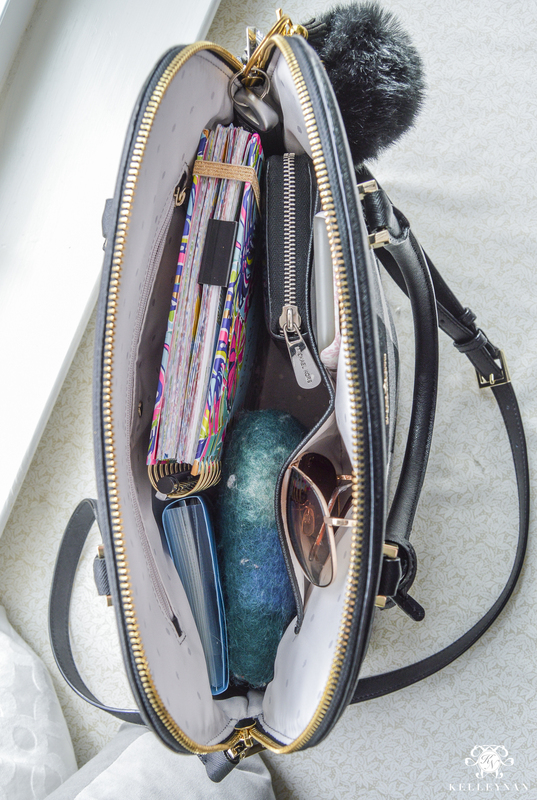 For now, I’m sticking with my Kate Spade Mega Margot (HERE); it’s still on major sale has free shipping, and if you sign up for emails, you can get an additional 15% off the sale price 😉 The blue mini file has allocated sections for coupons, receipts, and other papers to file. This simple task not only cleared the clutter from my bags, but freed the clutter from my mind. Check off another one of those lingering to-dos! I start with a 2″ 3-ring binder. 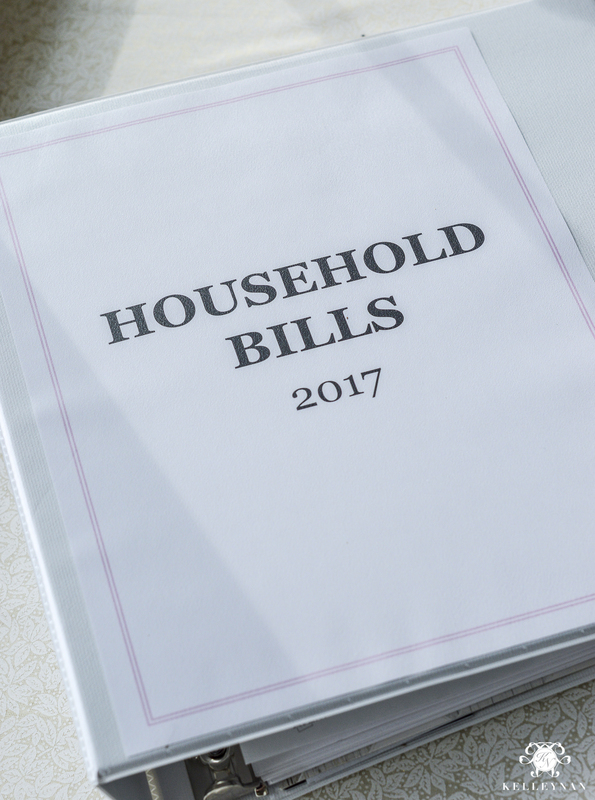 If you go for a smaller version, you likely WILL run out of room before the end of the year. These tabs are my favorite because they allow for up to 31 sections, with a table of contents in front. Whenever bills come in, I put them in this folder in the back pocket. Twice a month on the 1st and 15th, I take out the folder, sit down, and pay everything that is due. I three hole punch each bill and put it behind its respective tab as I make each payment. I keep scratch pads (usually collected from hotels 😉 ) in the front pocket and keep record of each date I make payments. Whenever I make payments the next date, I refer back to see what I paid on the previous date to make sure I’m not missing anything. If you are struggling with relaxing or organizing this weekend, try some of these for a win-win. What are your favorite lazy organization projects? 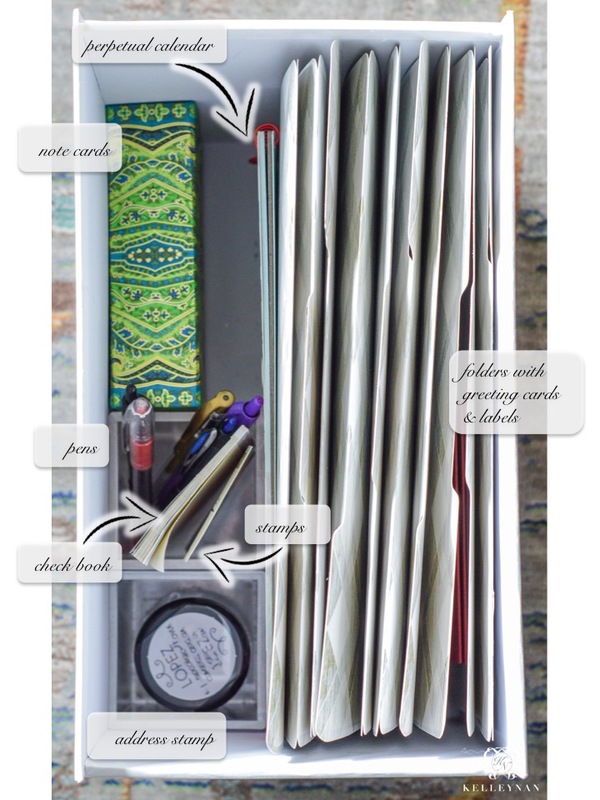 Coming next- my finally organized office drawers! If you’ve missed any of my other recent organization posts, you can check those out by clicking on the images below. Jenny, sounds like you are on top of it!! That is awesome! Bethany, I am so glad! Happy organizing! These are great ideas Kelley! I get bored with TV but my husband likes me to “watch” with him…PERFECT post, girl! Tammy, that is so good to know! My mom always tells me to check Dollar Tree, too! 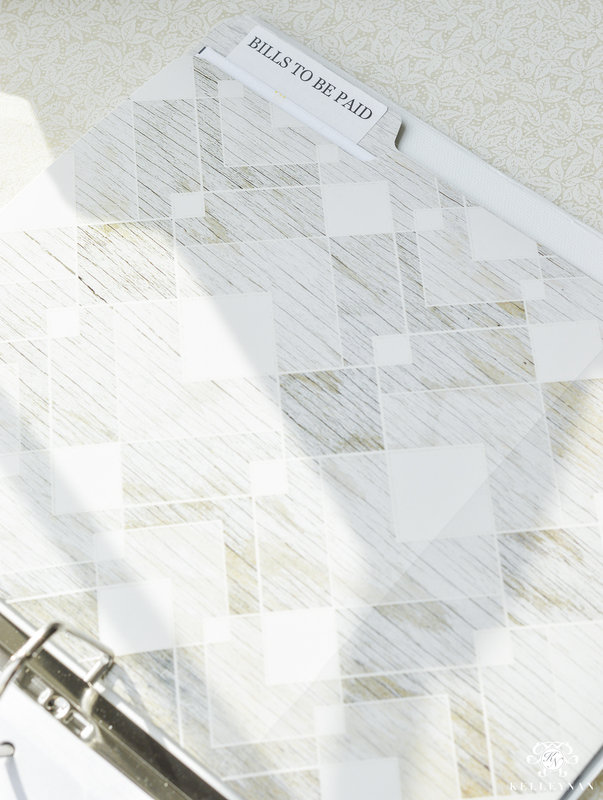 I am a blank note card addict- I pick them up everywhere! So glad you share in the card addiction, too!! I am so glad! Yes; I love staying busy in front of the tv! Kelley, I’m surprised you haven’t gone to paperless billing. I love it! I used to have a bunch of file folders (all neatly labeled) woth matching file folder hangers (also labeled with those plastic tab thingys). Frankly it was a pita and took up a bunch of space. I had to have a large file drawer to hold all those bills that accumulated month after month, year after year :(. Now, other than one off bills (like taking my kitty to the vet for a yearly checkup for instance) all my regular bills are automatically paid via my bank account or visa every month. Since I’m such a procrastinator, writing a cheque and Especially mailing it or even paying it online was a chore I decided I didn’t need to burden myself with and it’s a weight lifted off my shoulders. Now, the monthly bills I set up to be auto paid my bank, I don’t even worry about. The few bills I set up to be auto paid by visa means that I just have to pay my visa online once a month. All of this is completely paperless!! To see what’s paid by either my bank or visa I just look at the bill or withdrawal in my online bank account (I check once a month to see if any strange or unknown items are charged). I used to have 4 file drawers filled with useless paper, now I have half a drawer. I need you to come and overhaul every drawer and closet in my house…please?! I am so unorganized!! I love these – every single one!! Tam, I wish we could do it together!! Brittany, that is awesome! Getting organized and having dedicated spaces like that ARE so satisfying! I’m with you on needing to have my paper bills also. What I want to know is how to organize my photos. I hate that we now have gone digital with so many of our photos. I truly intend getting around to getting them printed off my phone someday. In the meantime, I do have boxes of photos that I need to find a system and a way to organize. Any ideas?